Access Bank Zambia Plc, one of Zambia’s emerging banks has partnered with MTN Zambia to allow Access Bank Zambia customers to transfer money from a bank account to an MTN Mobile wallet and vice versa by simply dialling *801#. This is a significant step to improve the quality of service as well as enhance financial inclusion. The new service allows Access Bank Zambia customers to conduct mobile money transfers to MTN Mobile Money and vice versa. To transfer money from an Access bank account a customer will first have to dial *801# > Mobile Wallet > Link Account to Wallet. After that, the user will be able to transfer money from Access account to MTN wallet and vice versa. Introducing this new service, the Managing Director Access Bank Zambia, Mrs. Joana Bannerman indicated that the Bank is continuously pursuing its retail banking strategy by enhancing the efficiency of its electronic banking services. According to the Bank, one of the major advantages of the service, which is available on mobile phones, is that it does not require internet to operate. The ultimate aim for the Bank is to make banking available no matter where you are in Zambia. Barwuah pointed out that this is the next phase in broadening the offering of financial services product to the unserved and underserved population in Zambia and deliver relevant and innovative mobile solutions to help customers overcome their daily challenges, once again offering Zambians the tools to feel free and improve their lives. Barwuah further noted that the launch of a strategic partnership with Access Bank will enable thousands of customers across Zambia to send and receive money from their bank accounts to their mobile phones and vice versa. 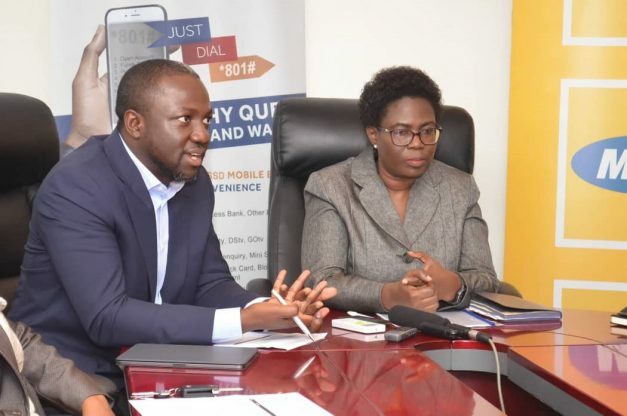 MTN Mobile Money has over 3.5 million customers who once registered can enjoy access to convenient ways of mobile commerce services such as; deposit and withdraw cash, money transfers, banking services, paying bills, buying goods and access to more than 17,000 Mobile Money agents throughout Zambia. This collaboration provides Access Bank customers and MTN Mobile Money customers with new and exciting capability and flexibility of moving funds around. The introduction of the MTN wallet is in line with the Bank’s 5-year strategy, which is expected to accelerate the Bank’s growth and position it as a leading Bank across its various operating markets by 2022. Last year the Bank unveiled its remittance payment platform “Access Africa” across its operational countries to remove boundaries across Africa to enable both customers and non-customers transfer money conveniently across Africa.